Bittersweet delights at the Astor Theatre in St Kilda last night for a special screening of Bruce Robinson’s masterpiece, Withnail and I. A first big screen viewing of one of my favourite films would have been enough to make me part with my cash, but the added bonus of a Q&A with principal actor Paul McGann ('I') was too much to miss. Surprisingly handsome for his 50 years, McGann is refreshingly cognisant of the affection people have for Withnail, and is rightly proud of his association with it. Even from within the fug of his jetlag McGann’s (presumably oft-repeated) anecdotes were funny, interesting and insightful and certainly added to the experience of watching the film yet again (though clearly some in attendance had watched at least a thousand times more than I). Certainly Uncle Monty’s predatory stalking of young Marwood (‘I mean to have you, boy, even if it must be burglary!') has a new flavour when you know a young Robinson was similarly advanced upon by Italian director Franco Zeffirelli. 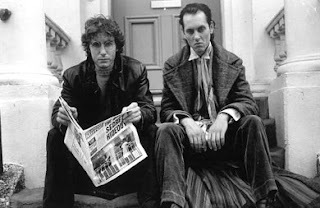 I’m rarely backwards coming forwards with superlatives but Withnail and I is truly one of the finest British movies ever made; a unique and hugely entertaining piece with pathos, wonderful performances across the board and more one-liners than an entire series of Blackadder. Indeed – Tarantino aside - it’s hard to think of many comparable films with so many distinct and iconic set pieces; with every scene offering something quotable. That it was made for pittance by George Harrison’s Handmade Films in the same year as 9 ½ weeks, Karate Kid II and Pretty in Pink makes it even more remarkable. The observation by McGann's son that Withnail was as out of time in 1986 as an album by The Smiths is perhaps most profound of the night. With regards to McGann, there is no escaping the evening’s sub-plot that it is rather a shame he should be reduced to giving such presentations. His marvellous performance in Withnail hardly suggested a film career summed up with difficulty by the MC as roles in Alien 3, Empire of the Sun and the recent Lesbian Vampire Killers. Even the timing of his mid-nineties appointment as the eighth Doctor Who seems slightly tragic given that show’s status in 2010. Consequently the event was slightly tarnished by a sci-fi convention approach that over-emphasised the money-making nature of such special screenings. Perhaps the mania encountered at such conventions has led McGann to the conclusion that fans of all genres can be easily parted from their money, but selling autographs at $25 a pop, he seemed relatively untroubled at his signing table throughout the night. And this despite a frustrating and overlong intermission designed to drum up trade. Perhaps Withnail and I enthusiasts are cut from a different cloth. With sympathy for McGann’s situation (though to be honest he’s never really been short of work) it’s hard not to recall Withnail’s self-pitying admission: ‘I'm a fully trained actor reduced to the status of a bum’. I am envious. Being in the room with the best-looking McGann brother. You have read With Nails, I assume, Richard E Grant's diaries, in which he describes McGann's youthful hubris and ambition. You capture the occasion wonderfully for the rest of us, thanks.